Each iceberg is close enough together in Iceberg Alley that it creates a window exposing the snow on the hillside off the Great Northern Peninsula in Newfoundland, Canada. Massive icebergs float in Iceberg Alley outside of St. Anthony in Newfoundland, Canada slowly passing each other in the waves of the Atlantic Ocean. 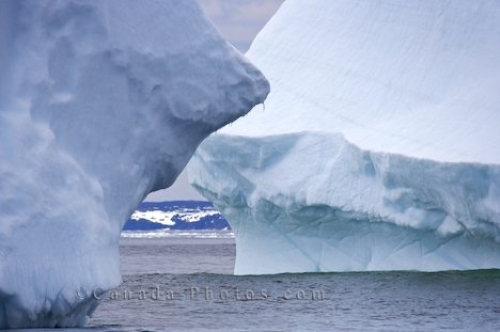 The scenery of the snow covered hills slowly disappears as the window created between these icebergs begins to close up. Iceberg in Iceberg Alley during an Iceberg Watching Tour with Northland Discovery Boat Tours who operate out of St Anthony, Viking Trail, Great Northern Peninsula, Northern Peninsula, Newfoundland, Canada. Picture of a window of opportunity for a photographer to get two icebergs together in Iceberg Alley in Newfoundland, Canada.